Use an electric mixer to combine the cream cheese and condensed milk, mixing until well blended. 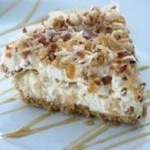 Fold in the whipped topping and one-half of the coconut mixture. Pour one-fourth of this mixture into the bottom of the two crusts. Spoon on as much caramel topping as you wish. Pour over the rest of the cream cheese mixture. Sprinkle with the remaining coconut and pecans. Freeze the pies at least 4 hours. Remove from the freezer about 20 minutes before serving time. Return any leftover pie to the freezer.